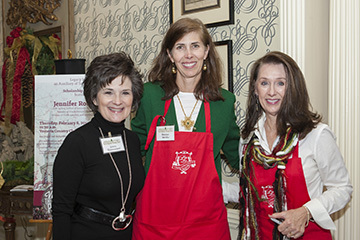 Samford University’s Legacy League will host its fifth annual Christmas Home Tour Thursday, Dec. 10. The popular holiday event will showcase five homes in Mountain Brook and Vestavia Hills, Alabama, ranging in style from traditional to contemporary. Proceeds will help provide life-changing scholarships for students with significant financial need. Featured homes are those of Tricia and Mark Drew, 4105 Kennesaw Drive; Dimity and Alex Leath, 4405 Old Brook Run; Lynn and Duane Randleman, 2717 Old Trace; Shannon and Richard Riley, 3505 Brookwood Road; and Jeanna and Andy Westmoreland, 1994 Shades Crest Road. The final home is the residence of Legacy League Executive Director Jeanna Westmoreland and Samford President Andy Westmoreland. At that stop, visitors may shop at a holiday gift market and enjoy hors d’oeuvres. The gift market, sponsored by Event Rentals Unlimited, will include a selection of jewelry, art, children’s items, clothing, food, accessories, home items and more. The homes include styles representative of the English Arts and Crafts movement of the late 19th and early 20th centuries, New England architecture, Frank Lloyd Wright influences and other distinctive design elements. All will be decked out in festive holiday splendor. Guests may drive to and park at each home. Maps will be available at each location. Homes will be open 10 a.m.–2 p.m. and again 4–8 p.m. Tickets are $25 through Dec. 8 or $30 at the door during tour hours. Details are also available at 205-726-2247. According to Legacy League President Kathryn Woodruff, league members are excited about this year’s tour, especially after last year’s record-setting event. “Not only are this year’s homes really extraordinary, but the first-ever holiday gift market with a dozen vendors will offer all kinds of things,” Woodruff said.